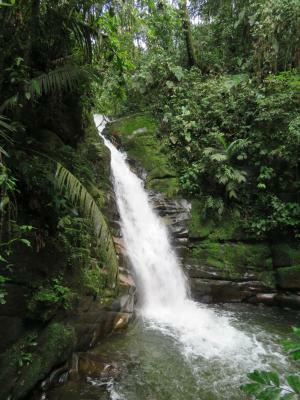 Lock in a great price for La Cabaña Ecohotel - Valle del Cocora – rated 9.7 by recent guests! I already had extremely high expectations given this property was rated an average 9.7 when I had stayed, so where do I start? I WAS BLOWN AWAY! Maria was very accommodating from the start and throughout the stay. The service felt like the Ritz Carlton. Rooms were quaint, bathroom modern, and probably the most comfortable bed I slept on in Colombia! The food is priced well below what I had expected and was some of the best tasting food I’ve had in Colombia! I was going to eat in solento but decided to stay and try everything on Maria’s menu! 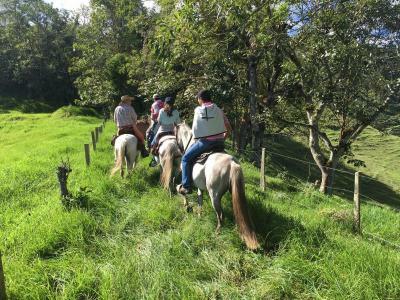 Tons of local activities including horse back riding that Maria arranges personally with her own horses. The views are incredible throughout the property. If you want to escape and be in heaven by the surrounding Colombian Andes, then this place is for you! Thanks again Maria! The rooms are spacious, well maintained. The bed is so comfortable. The view is amazing. The service is phenomenal. One of the best hotel experiences I’ve had. The owners are attentive, friendly, and catered to all our needs. Helped us plan all the activities, booked tours and transportation for us, answered all our questions, big and small. The farm surrounding the property is beautiful, and the river is steps away. It has a very good hiking trial on the property. The facilities are great and the view in every direction is amazing. The differentiator is the staff. Lina and her team will take care of you. She can arrange tours on short notice, provide you suggestions, anything you need. If you want to visit Salento, make sure La Cabaña is available. One of our favorite hotel experiences of all time. La Cabaña is managed by the nicest family who go out of their way to make you feel at home. A beautiful property located in the most stunning location outside of Salento. Highly recommended! lovingly tended family farm with amazing service and offerings! go, just go! don’t hesitate at all! Where do I start? 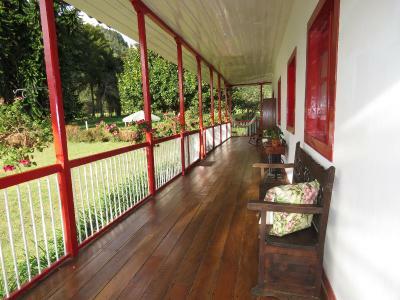 A very charming hotel on a dairy Farm in a exquisite pastoral setting with a congenial atmosphere. Activities are nicely describen in a book. The restaurant on-site was excellent. Héctor, the owner and his daughter were extremely attentive wanting to be sure the needs and interests of the guests were met. Dad Maria Jeeps Drinking outside with the cats and cows Staff Bed Shower Breakfast Did I say Maria? That American school grad! I tried to figure Maria's personality, that's my job at a university. She is personable, adaptable, and gets it done. Also, she lights the super cool table candle while we drank hella wine discussing the area. I also graded 60 college student papers in the most serene area one could imagine. This place is a 100% lock. ps. If you are a prof, grade papers here! Everything! I felt as if I was a part of the family. Everyone was so helpful, kind, and eager to welcome us to their beautiful country of Colombia. I could not be more grateful. The hotel is set in the countryside, which I loved. The rooms are well appointed, and the staff is very accommodating. I loved the horseback riding. Hector took us through the countryside and helped me as it was my first time on a horse. Also the dinner was excellent, far better than the food I had in town. The breakfast was great also. I would love to return! One of our top picks in Salento – and a guest favorite. Featuring free WiFi, Ecohotel La Cabaña offers pet-friendly accommodations in Salento. Guests can enjoy the on-site restaurant. Free private parking is available on site. A TV with satellite channels, as well as a laptop are provided. Each room comes with a private bathroom. You can engage in various activities, such as horse riding, cycling and fishing. Pereira is 16 mi from Ecohotel La Cabaña, while Ibagué is 25 mi away. The nearest airport is Matecaña International Airport, 17 mi from the property. 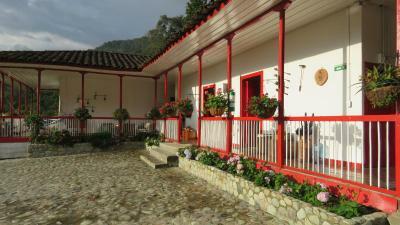 When would you like to stay at La Cabaña Ecohotel - Valle del Cocora? This twin/double room features a patio, private entrance and cable TV. This triple room features a mini-bar, flat-screen TV and patio. This single room features a patio, satellite TV and private entrance. House Rules La Cabaña Ecohotel - Valle del Cocora takes special requests – add in the next step! La Cabaña Ecohotel - Valle del Cocora accepts these cards and reserves the right to temporarily hold an amount prior to arrival. Please note that 50% payment is needed previous to arrival. Please inform La Cabaña Ecohotel - Valle del Cocora of your expected arrival time in advance. You can use the Special Requests box when booking, or contact the property directly using the contact details in your confirmation. Hector is absolutely top host, he shared with us an autenthical atmosphere and fluidum. We have felt as a long time friends, although we met first time in life. An atmosphere of a hotel, an area a land is amazing. Everything about Last Cabaña was amazing. The only thing I didn't like is that I had to eventually check out. There cannot be a better place to stay in Salento then La Cabaña Ecohotel. First of all, the location is perfect: on the road to Valle de Cocora, so he top attraction (the 70 mtrs high palmeras) are very near and easy to get to, you just hop on the first colectivo that passes by. At the same time, it is only a 5 minute ride with a colectivo away from the village center, and you pay 1000 pesos (30 cents) to get there. The owner - Hector - and all of the staff in La Cabaña, do everything to make you feel at home. 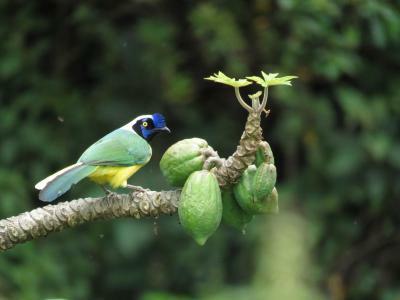 Hector is very knowledgeable about the area and helps you to organize tours and activities. 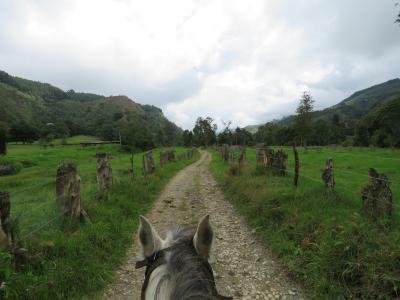 Not only is there the hiking at Valle de Cocora, you can also do a 3 hrs hike in and around the farm, take a coffee tour, ride horses, and so much more. Obviously Salento itself, is very much worth spending a few hours. The hotel itself is a centuries old ranch, carefully renovated and redesigned with modern day comfort as an ecohotel. All rooms are beautifully decorated, with beds that are super comfortable. Showers have hot water the whole day through, and the wifi is good, in all common areas, on the garden terrace, and in the rooms. At the same time of being a hotel, the ranch is still an operational farm. Not only can you see various activities on the farm and/or help milking the cows, you also get milk, yoghurt and cheese produced at La Cabaña itself. Breakfast is top and included in the room rate. Dinner is prepared on request. If you are lucky, Hector might be having a traditional Colombian bbq, don't miss that opportunity because you'll taste the best roast ever!!! There are no words to describe the fantastic 4 days I had at La Cabaña. 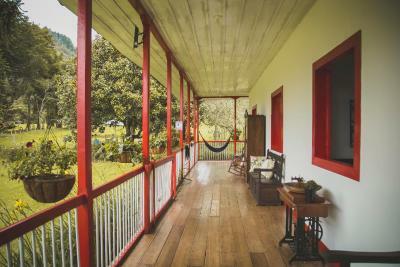 You are in the middle of one of the most beautiful parts of Colombia, with tons of excursions and activities possible, and you are residing at the same time, in a beautiful country house, surrounded by nice people and animals and all peace and tranquility. Really the max!!! Everything!!! What a great hidden gem. Owners are the nicest people we met in Colombia. Maria our hostess was amazing. We felt very welcome during our stay. The location and accomodation were lovely as well. If we ever return to Salento, we would definitely stay here again! Very nice place with a lot of charm! We had a dinner (Colombian bbq) which was great and the host was very helpful. Not a single bad word to say! An incredibly beautiful hotel which combines the feeling of a traditional finca (country home) with boutique hotel comfort. 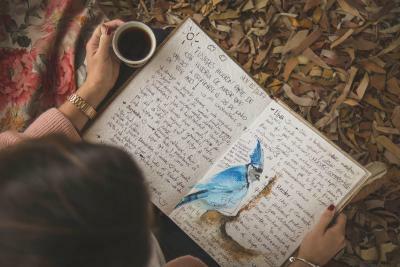 The attention to detail is impressive, with some features usually only found in five star hotels: luxury bedding, amenities, complimentary herbal tea and coffee selection. The rooms are decorated with excellent taste and the property is full of secret hammocks, flowers and adorable horses, baby cows and cats! Maria was very attentive during our stay and was always ready to answer questions. The restaurant's food is exceptional (try the coconut lemonade) and much higher quality meals and wine than what is usually found in the area. I booked a massage onsight which was also exceptional.